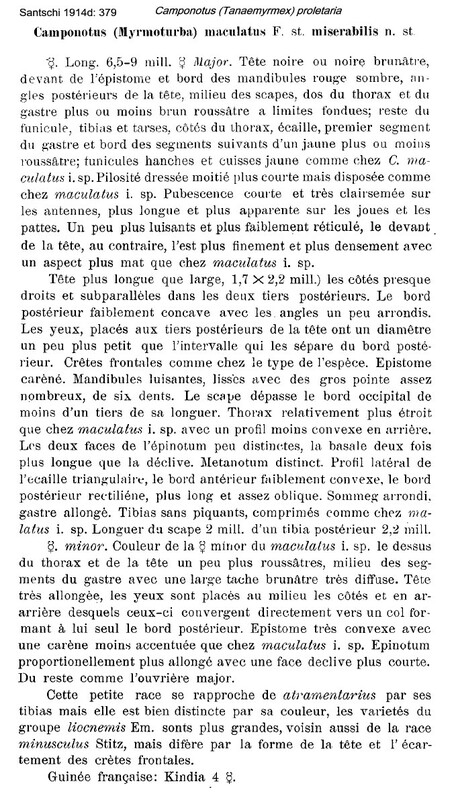 Type location Guinea (Camponotus (Myrmoturba) maculatus F. stirps miserabilis n. stirps. Santschi, 1914d: 379, major & minor workers) collected by F Silvestri at Kindia; renamed proletaria by Baroni Urbani (1971b: 362, solely as a replacement name according to Baroni Urbani, 1972: 126, who placed it as a junior synonym of Camponotus maculatus) . Santschi's (1914d) description is at . The illustration is from Santschi (1915c: 282). 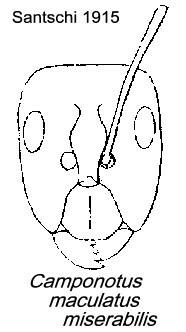 The major head (illustrated by Santschi) is much narrower than that of Camponotus maculatus. The minor shown below has an elongated head. The photomontage is of the type minor worker collated from http://www.antweb.org/specimen.do?name=casent0911997. The photomontage is of the major worker from Benin, Korobouro; J-F Vayessieres (RVA2903). The photomontage is of a minor worker from Benin (as above).